Gears of War 4 releases October 11th 2016, and pre-orders are now available. Experience the next chapter in the Gears of War saga following JD Fenix, son of Marcus Fenix, as he discovers the source of a monstrous new enemy with close friends Kait and Del. On top of the Campaign, which supports two player co-op locally or over Xbox Live, fan favorite mode Horde is back and better than ever. Additionally, Versus Multiplayer sports 60 fps, dedicated servers, brand new modes, a new visible ranking system and much more. The Standard Edition is the base version of the game, arriving October 11th, 2016. Digital purchases of the Standard Edition come with Xbox Play Anywhere, which means Buy Once, Play Anywhere. When you purchase a digital copy of Gears of War 4 is on Xbox or PC, you’ll gain instant access to the game on both platforms at no additional cost. Any progression or content you acquire on one platform, including Season Pass and Gear Pack content, will also be available on both platforms regardless of where you buy. Pre-order from the Xbox Store to get an exclusive Vintage Del Gear Pack -- featuring a Vintage Del character skin, emblem, two Vintage weapon skins and a special Vintage Del bounty -- as an added bonus for use in Gears of War 4. Pre-ordering digitally also provides instant access to the Gears of War: Ultimate Edition Character Pack for use in Gears of War: Ultimate Edition. Check with your local retailers for specific preorder items. All pre-orders also come with the Brothers to the End Gear Pack. Gears of War 4: Ultimate Edition comes with the Standard Edition, plus a bunch of extras for fans to sink their teeth into. EARLY ACCESS: Gears of War 4: Ultimate Edition is your gateway to Early Access to the game, allowing you to play from Friday, October 7th – four days before the release date. This applies to both Physical and Digital editions of the game. Five exclusive digital items as part of the Vintage VIP Pack, including the Vintage JD character skin, Vintage Gnasher and Dropshot weapon skins, Vintage JD Emblem and Vintage JD Bounty for extra XP. Permanent DLC map ownership of over 24 additional maps (two per month for a year) for private play on dedicated servers for all competitive Versus modes and Horde. Access to an exclusive ‘Developer Playlist’ where new maps, modes and features can be tested prior to broad release. Six Gear Packs which unlock special character and weapon skins and XP boosting bounties. PHYSICAL EXCLUSIVE – STEELBOOK CASE: Arm your games cabinet with a premium Steelbook Case for Gears of War 4. DIGITAL EXCLUSIVE – Xbox Play Anywhere: Buy Once, Play Anywhere. Whether your first digital purchase of Gears of War 4 is on Xbox or PC, you'll gan instant access to the game on both platforms at no additional cost. Any progression or content you acquire on one platform, including Season Pass and Gear Pack content, will also be available on both platforms regardless of where you buy. XBOX STORE PREORDERS ONLY: An exclusive Vintage Del Gear Pack -- featuring a Vintage Del character model, emblem, two Vintage weapon skins and a special Vintage Del bounty -- as an added bonus for use in Gears of War 4. Digital pre-orders gain instant access to the Gears of War: Ultimate Edition Character Pack for use in Gears of War: Ultimate Edition. All pre-orders also come with the Brothers to the End Gear Pack. 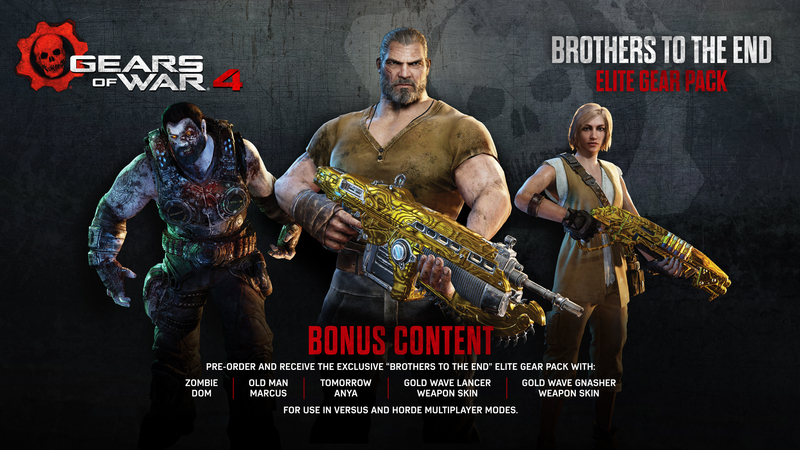 The Brothers to the End Elite Gear Pack is a new pre-order bonus included with Gears of War 4 that pays homage to some of the most beloved characters from the Gears of War universe, and extends the tradition of offering gold weapons to day one players. “Tomorrow Anya” Character - Named after her famous words following the end of the Locust War (“Tomorrow Marcus. We finally have a tomorrow.”) Her appearance is based on her look in theGears of War 4television commercial, “Tomorrow,” where she was introduced as the mother of JD Fenix. “Old Man Marcus" Character - Featuring an older Marcus Fenix as unveiled in the E3 2016 media briefing demo. Twenty-five years after the Locust War, Marcus and the COG have long since parted ways. His facial hair has grown long and his COG regulation kit has been replaced with by civilian clothes. “Zombie Dom” Character - There's no keeping a good solider down, at least in the form of this character skin created as tribute to Marcus’ dearly departed best friend Dominic Santiago. Gold Wave Lancer and Gnasher Weapon Skins - Updated versions of the gold weapon skins awarded to the series’ most-dedicated day one players. The Brothers To The End Elite Gear Pack is included with every edition of Gears of War 4, including the custom Gears of War 4 Limited Edition Xbox One S and our Gears of War 4 Lootcrate. All new and current pre-order customers will also receive the Vintage Del Pack, which includes the Vintage Del character model and retailer-specific bonus items, including unique weapon skins. For a limited time, all purchases of Gears of War 4 include the entire Gears of War Xbox 360 library for free, all playable on Xbox One thanks to Backwards Compatibility! 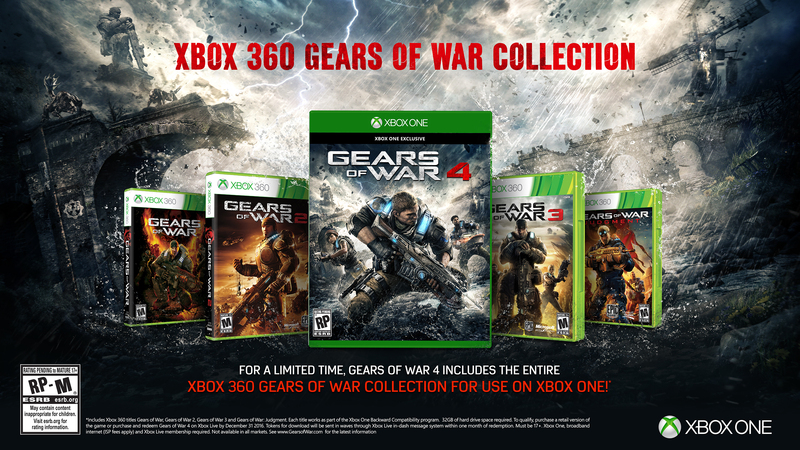 The Gears of War Xbox 360 collection provides you with four incredible games, from the epic saga of the original Gears of War trilogy to the standalone story of Gears of War: Judgment. Physical copies of the game will come with codes for each of the four titles to download via Xbox Live. For those who purchase digitally, your codes will be sent via Xbox Live message – we’ll be sharing more information on digital distribution closer to launch. Pre-order from the Xbox Store to get an exclusive Vintage Del Gear Pack featuring a Vintage Del character model, emblem, two Vintage weapon skins and a special Vintage Del bounty as an added bonus for use in Gears of War 4. Pre-ordering digitally also provides instant access to the Gears of War: Ultimate Edition Character Pack for use in Gears of War: Ultimate Edition. We also know there’s a passionate following of Gears fans who desire Collector’s Editions that come with physical items – such as Gears of War 3’s iconic Marcus Statue. For Gears of War 4, we wanted to provide the most flexible option for fans to purchase how they want and where they want – we’re excited to announce today that we’ve teamed up with Triforce to provide a Collector’s Statue for Gears of War 4! The statue featured JD on a COG Bike which stands at 11 inches tall, and 19 inches in length. The Statue is also bundled with a Lithograph of the concept art for the COG Bike and an awesome Frag Grenade keychain (perfect for tagging to your keys, not so much for tagging your friends). There’s also two variants of the statue to choose from – JD in COG Armor, or JD in Outsider clothing (exclusive to Amazon US). By keeping things separate, you can choose how you want to buy Gears of War 4 – physically or digitally, and either of the two editions on offer. Some retailers will be bundling the game with the Collector’s Statue, while others will offer it for standalone purchase. See our FAQ at the bottom of this page for more information. We’ll have more details to share closer to release, such as news on pre-loading, exact early access times on October 7th for Gears of War 4: Ultimate Edition owners, and what to expect from the Developer Playlist. Thank you for all your feedback and support for the Gears of War 4 Beta. We look forward to playing with you for another week on the Beta, and then the final release this October (we’ll be the ones going for the Dropshot Execution!). See you online. Pre-order digitally through the Xbox Marketplace to recieve instant access to the Gears of War: Ultimate Edition Character Pack! 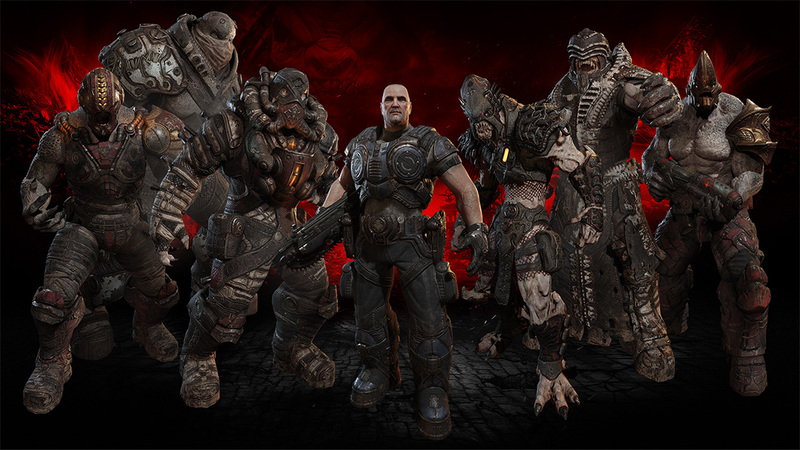 This pack includes seven unique multiplayer character skins which you can use in competitive multiplayer matches in Gears of War: Ultimate Edition. Characters include: Adam Fenix, Golden Hunter, Golden Miner, Savage Drone, Savage Grenadier, Savage Kantus, and Savage Theron Guard. If I pre-order Gears of War 4: Ultimate Edition through a retailer, do I still get 4 days early access? Yes! We’re extremely happy to be able to team up with retailers to ensure physical purchases of Ultimate Edition also gets fans into the fight early. More details will be announced by retailers closer to release about how to pick up your copy on October 7th 2016. Does the physical copy of Gears of War 4: Ultimate Edition come with a download code or disc for the game? The physical copy of Gears of War 4: Ultimate Edition comes with a disc. How can I pre-order Gears of War 4 on Windows 10? Gears of War 4 on Windows 10 is exclusive to the Windows Store, and not available at retailers. Pre-orders for the Windows 10 version are currently not available – however, you can pre-order a digital version of the Xbox One version via your Xbox console or Xbox.com, and receive day one access thanks to Xbox Play Anywhere for the same price. You’ll also have the added bonus of owning the game digitally on both platforms, and any pre-order DLC for use in Gears of War 4 will work on either platform. Do I have to buy digitally if I want to play with friends on another platform? No. Crossplay is enabled regardless of if you buy physically or digitally, meaning you can play with friends in Crossplay compatible modes regardless of how you prefer to purchase. Xbox Play Anywhere – which means one purchase at no additional cost provides you access to both the Xbox One and Windows 10 versions of the game – is exclusive to digital orders only. What happens to my progression and DLC if I play on another platform? All your progression, saves and DLC transfers to both platforms free of charge. If you choose to split your time between PC and Xbox One, you’ll carry everything from one to the other! What does it mean to own all future DLC maps with Season Pass if they are all free? We’re incredibly excited to be bringing all our future maps to all our fans for free, no matter which version of the game they buy. With 24 maps releasing over the year following release, we want to keep things fresh and focused – as such, we’re rotating maps in and out of availability in public play often. If you want to play a map in Private Match at any time, regardless of its public availability, the Season Pass gives you access to all future DLC maps in Private Play. This means you can take on Horde mode on any map you like whenever you like, as well as creating your own Versus matches with friends on maps of your choosing. As an additional note, ALL maps included at launch (‘in the box’) on release come with lifetime access to those maps for Private Matches. Is the Developer Playlist similar to the VIP Playlist in Gears of War: Judgment? No. The Developer Playlist will appear for a short period of time in advance of any content drops – such as new maps or modes – for fans to preview and test prior to their release to all players. Once that content drop has been released to every player, the playlist will disappear until we near the next content drop. 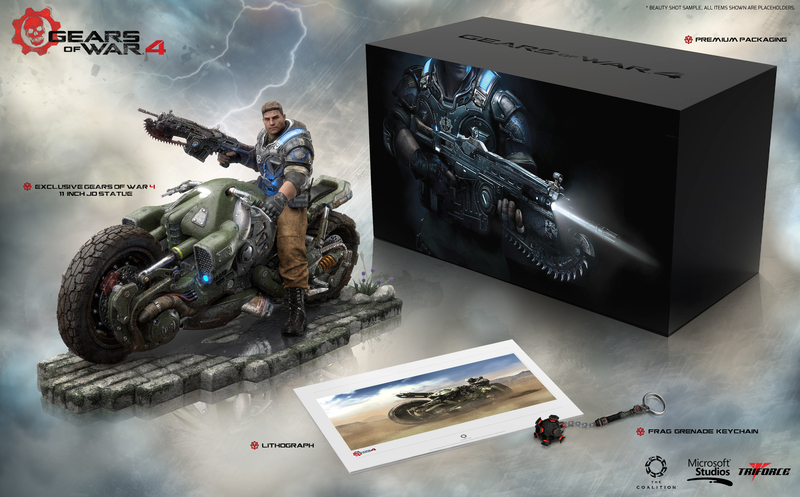 Is there an official Gears of War 4: Collector’s Edition? No. The JD COG Bike Collector’s Statue has been made in partnership with TriForce – each retailer who sells the statue will decide if it’s bundled with or without the game. Is the Collector’s Statue available to purchase in my region? Our partners at TriForce are working on making the statue available for purchase in as many regions as possible, including more retailers yet to be announced. We recommend following @ProjectTriforce on Twitter for the latest availability updates. Where should I direct any further questions I have about the Collector’s Statue?